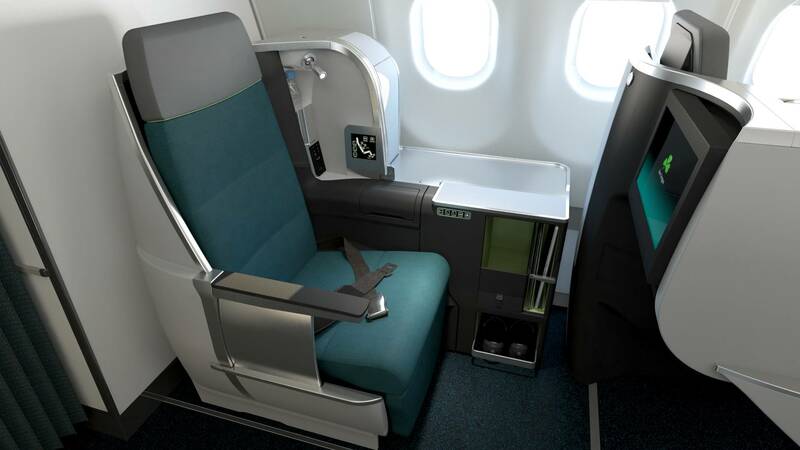 Aer Lingus is installing new fully lie-flat business class seats throughout its longhaul A330 fleet and the retrofit will be complete by the end of March. The new seat is a variant of the Vantage Seat by Thompson Aero we see on carriers like Austrian, Brussels, and Delta. When fully flat the bed is 6’6″ long and 22″ wide. 90% of the seats in the refreshed cabin will have direct aisle-access. The new business class will be available on all flights by the end of March. How Do I Know What Aircraft I am Flying On? Through the end of March, older configurations will still be in use, but you can use Expert Flyer to check the seat map on your flight. If you see a 2-2-2 config, that indicates your flight will have the old business class. If you see the following staggered seat map, your flight will feature the new business class. Introductory fare are reasonable — in some cases under 2,000EUR r/t — but Aer Lingus flights can also be booked with United and British Airways miles. United is a flat 70K miles one-way in business class from anywhere in North America to Europe (though only 57.5K miles under a promotion going on now) while British Airways pricing depends on distance. Business class between Boston and Dublin is only 25K each way while New York, Chicago, and Toronto cost 40K miles each way and Orlando and San Francisco are 50K each way. Business class space is incredibly poor right now, but it comes and goes. Space is searchable on Expert Flyer (U-class) or on united.com. More on the seats and the wholly redesigned business class experience later in the week! What flights from Orlando to Dublin have flat bed Business class seats? You can now take a Google Street View virtual tour of the Boeing 757 Business Class Cabin with lie flat seats.